Hey! You're not really a cupcake. *Sixlets are chocolate covered with a thin candy layer available from cake decorating and Hobby/craft stores, Ebay, Spotlight in Australia. Now I see that I forgive you, but first let me take just one little bite...ummm maybe 2 or 3. 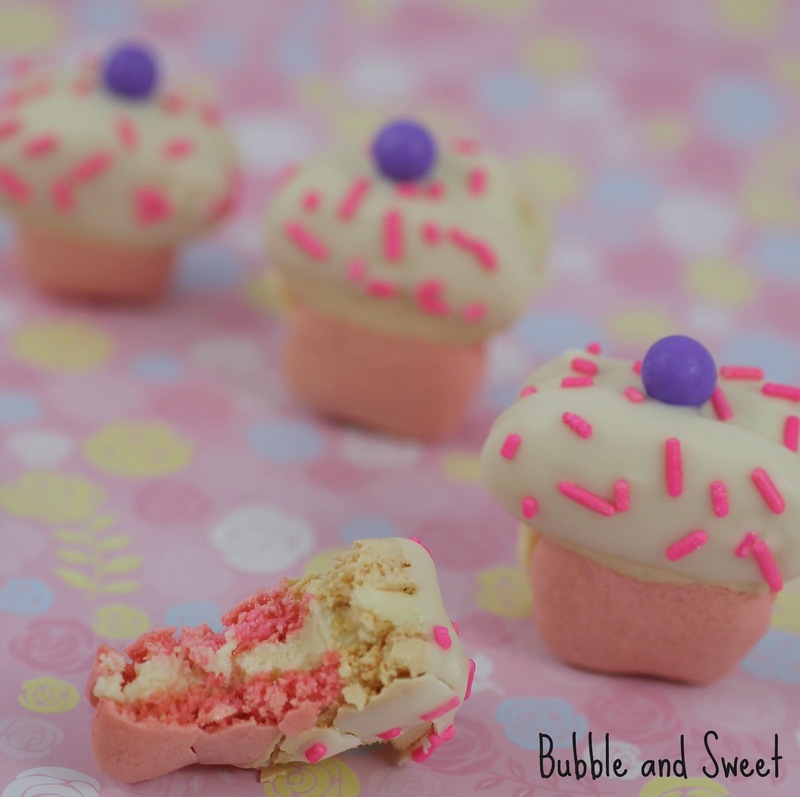 These pretty little cupcake shaped macaroons are made with my regular macaron recipe. Click HERE for my previous post which includes my macaron recipe. Then I just coloured 2/3rds of it pink and piped out little cupcake case bottoms, followed up with white puffy cupcake tops. I made my cupcake tops by piping 3 quick puffs right next to each other. just parchment/ baking paper on an Ikea Baking Tray. Bake as usual, match up like sized macaroons, fill with ganache and chill until set. 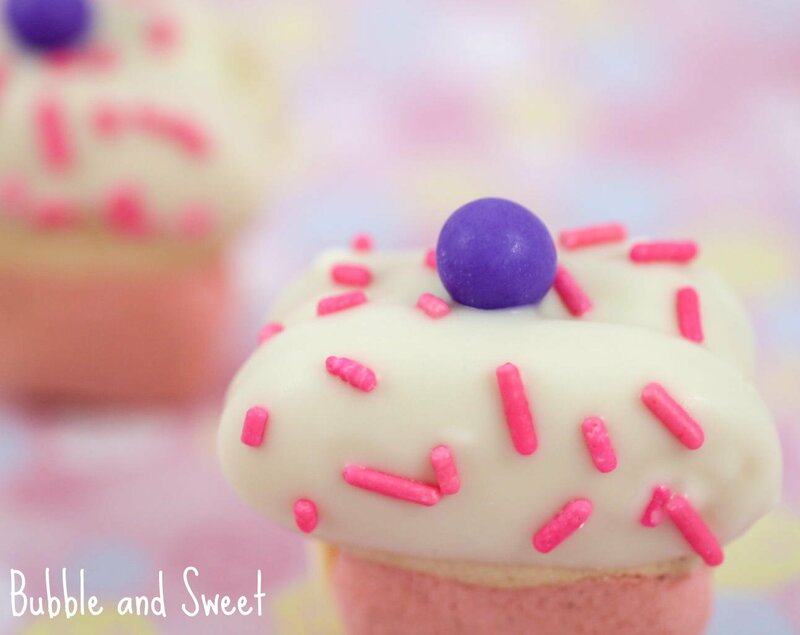 Melt some white chocolate#, dip the tops of the cupcakes in the melted chocolate, sprinkle on some pink jimmies and top with a sixlet (or a M & M would be good as well). #I used Wilton white chocolate melts with a little copra (paramount crystal) melted in to give a smooth finish that sets quickly and reduces the chances of the sprinkles and six let sliding off. 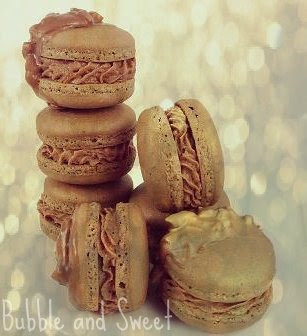 and apologies everyone I know I said I would share the recipe for my golden things macarons this week but something came up and I have not had time to finish the recipe for the blog. But just in case you missed the picture I will share it - oh my goodness they were super delicious. So Cute!!!!! Perfect for Valentine's Day or for any Cupcake Lover out there!!! These are so clever. Love! Cupcake Macarons dipped in chocolate that look lovely! You're a macaron magician, Linda! These are just about the cutest macarons I've ever seen! Qué buena idea! Las dos cosas que más me gustan! Me encantan! 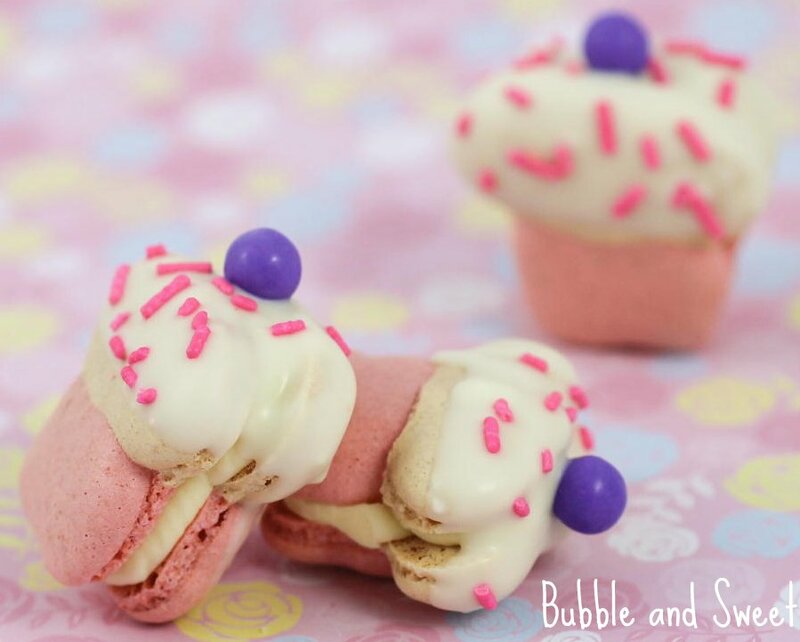 This is really so sweet information about Cupcake Macarons, I am really so much happy after visiting and reading this beautiful post, hope to get more tips in future also. Thanks for sharing. this site is good about sweet and its varieties. I loved it. yeah this site is really too good for the informaiton about sweets and its varieities, thanks for sharing with us. 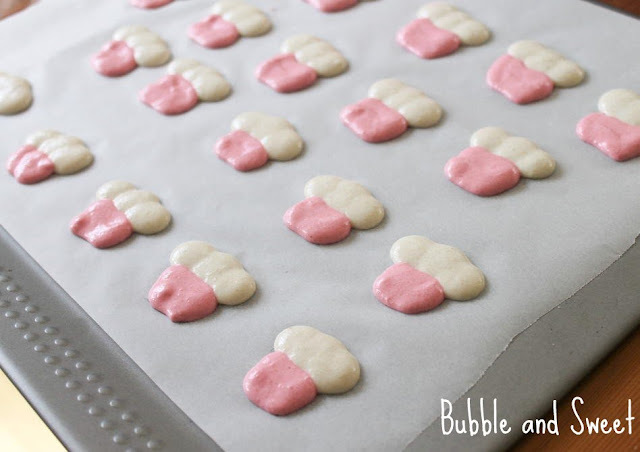 Too good information about Bubble and liked this blog and post it can be useful for those people who is looking to know about sweets and presents. 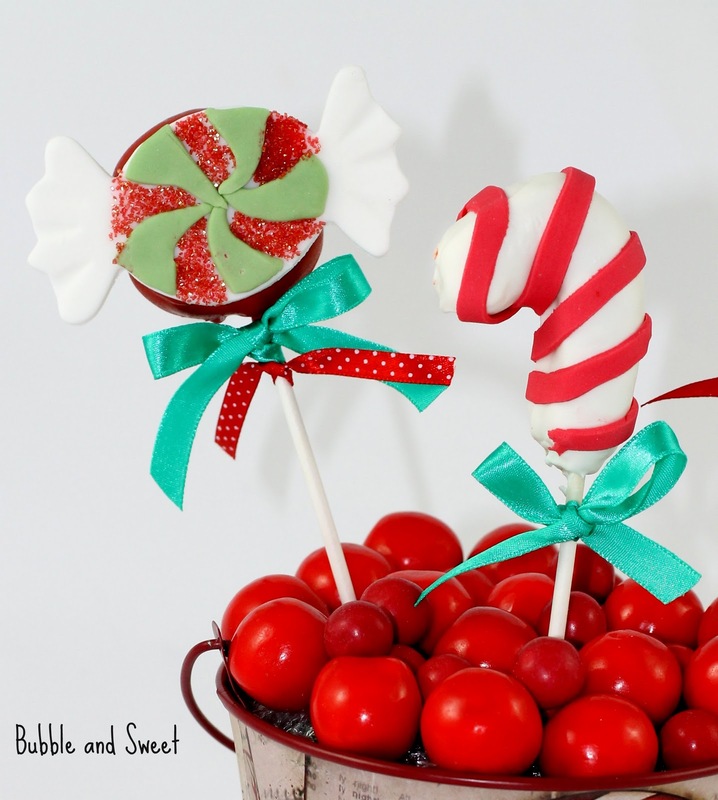 excellent post about sweet and present, so much helpful to find a gift pack. wow it is really too good and useful post about Cupcake Macarons. Binary Options Advices I really loved your tips. 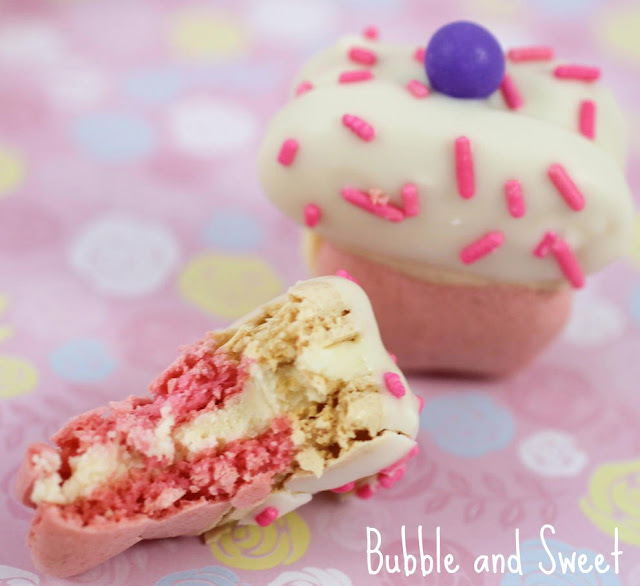 hi...This is really so sweet information about Cupcake Macarons, I am really so much happy after visiting and reading this beautiful post, hope to get more tips in future also. Thanks for sharing. yeah that the brilliant post about Cupcake Macarons, I will try it. thanks. so nice information about Cupcake Macarons, great job, thanks for sharing such a wonderful information. nice instruction to make Cupcake Macarons, so nice blog about Bubble and Sweets. thanks for sharing these ideas. wow !!!! that's really great information, I will surely follow your tips. yes friends, also agree with you, it is really so much useful info about Cupcake Macarons. thanks for the tip Linda Vandermeer. Thumbs Up For You. 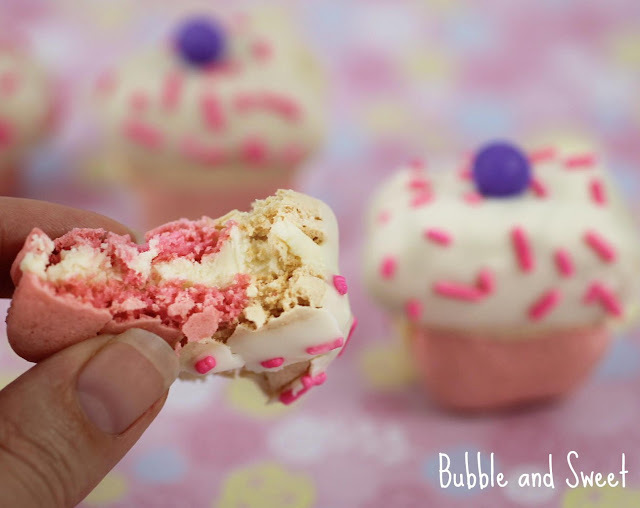 thank you for sharing so much brilliant tip to make cupcake macrons, that's great job Linda Vandermeer , thanks. yup, I also agree here. one of the best post about Cupcake Macarons, thanks for the idea.